A multimillion-pound investment supported by £1.6 million of EU and Scottish Government funding is to safeguard hundreds of jobs and create more than 40 new roles at a meat processing factory in Portlethen. The beef and lamb plant was taken over by Kepak Group – one of Ireland’s biggest red meat companies – last August and saw McIntosh Donald rebranded as Kepak McIntosh Donald. Money is now being ploughed into making the factory more efficient – helping to drive down costs for farmers – and increasing its production capacity. 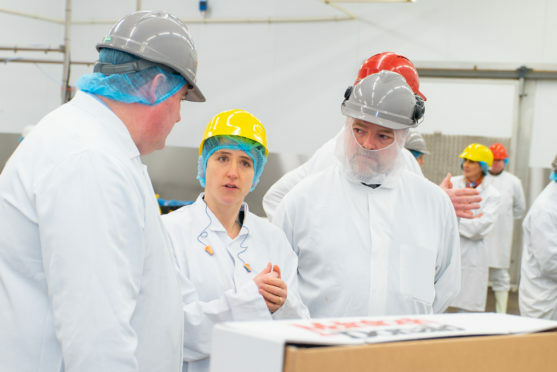 Rural Affairs Minister Mairi Gougeon visited the site yesterday to announce the Food Processing, Marketing and Cooperation (FPMC) scheme funding, which she said was part of “vital financial support” to more than 200 Scottish food and drink businesses. Ms Gougeon added: “This is great news for the local area, not just to the hundreds of workers and their families who will welcome the job security this provides, but also because the factory plays a vital role in helping farmers get their quality beef and lamb products from farm to fork. The FPMC scheme was securing the long-term viability of primary food producers and maximising export opportunities for “our fantastic Scottish produce”, she said. The factory currently employs about 350 workers but this is expected to mushroom to more than 400 as a result of the expansion. Site manager Alan Brown said the investment would create a “raft of new facilities”, with the work slated to be completed by the end of next year. Mr Brown added: “This will copper fasten the future of this business not only for all the farmer suppliers but for the growing number of staff who work here.